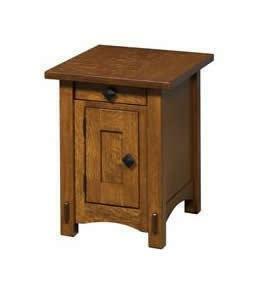 Our Amish Lucern Mission Large Cabinet End Table will add mission-style and storage to your living, office, or bedroom. This solid wood occasional is built standard with a 1-inch rectangular top, fully inset drawer with soft close undermount slides, fully inset Shaker-panel front door with soft-close hinges, arches at the base, and exposed tenons on the legs. This accent table can be custom-made from a variety of wood, finish, and hardware options. Shown in quarter sawn white oak with #3 hardware.